NECN's Early Warning Weather has provided plenty of notice on the upcoming weather this weekend which still promises to be spectacular! High pressure will slide over New England providing ample sunshine, and seasonal temperatures near 80-85 and sea breezes at the coast. An upper level low will continue to pull away, with a building upper level ridge over us. This will provide a more stable airmass, but still a few fair weather clouds could pop in the afternoon hours. 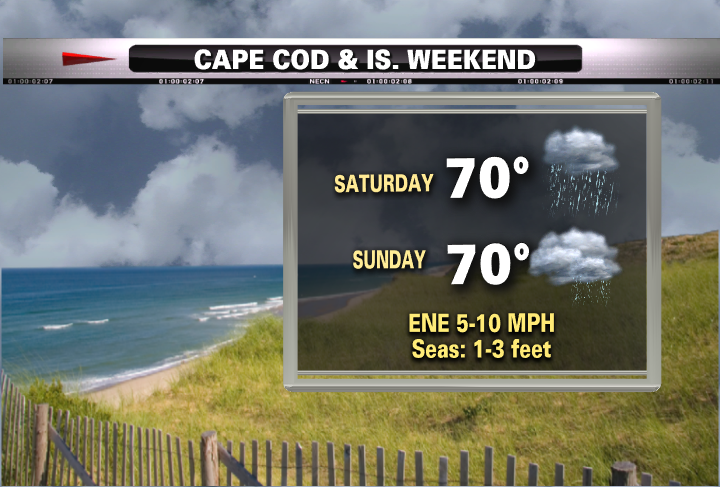 Overall, it is a gorgeous weekend on the Cape. 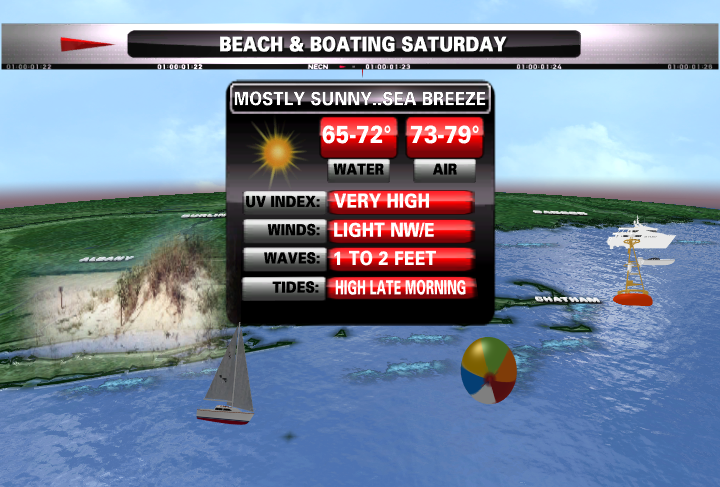 Make sure you have the sunscreen handy as there will be plenty of sun this weekend at the beaches. This weekend, Look up in the evening sky. It is not a bird, not a plane, it's a SuperMoon! This phenomenon occurs when the full moon coincides with the time the moon's orbit is closest to Earth...which is happening this weekend! This will be visible on Sunday night after sunset. Moonrise will be 7:35 PM. Supermoons can be up to 14 percent closer and appear 30 percent brighter, according to NASA. But wait! That is not all! After the August Supermoon watch for the shooting stars in the evening sky. The Perseid Meteor showers will start to become visible late this weekend when Earth passes through the debris zone left by Comet Swift–Tuttle. The Perseids, have been to know to offer stargazers a view of 100 shooting stars per hour at peak viewing. The peak will happen between August 10th and 13th. The light from the full moon may help to dim the view and make catching those shooting stars a bit more challenging. Getting away from city lights and into the country will improve your chances as well. Once the high slides off the coast next week, cooler onshore SE winds will shift into New England. Clouds will be increasing by Tuesday. The upper level ridge over us this weekend will shift east with another trough and upper low digging right over us for the midweek. This will come with a potent front, with a developing low along it, which will slide in from the Great Lakes and track right into New England for Wednesday. Today, it appears Wednesday will come with a soaking rain with the potential for some embedded thunderstorms. temps will likely be cool in the Lwr 70's due to the rain. The rain will begin to pull away Thursday, but the upper low will remain over us for the end of the week. Mixed skies, spotty showers with temps running seasonally cool for this time of year should be expected by the end of the week. 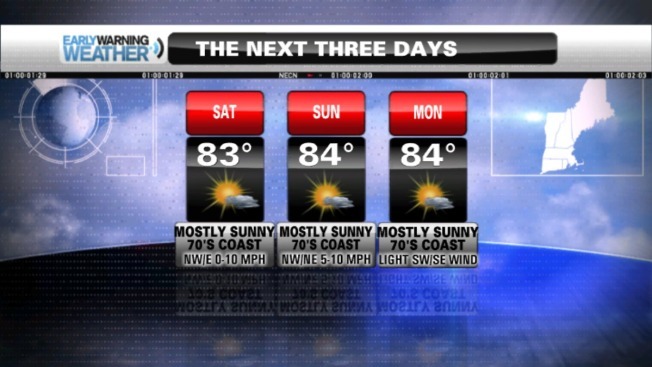 Next weekend looks dry this far our with temperatures gradually starting to moderate to near 80. The Climate Prediction Center is in agreement with this assessment. They have their 6-10 forecast out and they predict the days of August 14-18 will have temperatures running below the average because of the return of this trough into. the Northeast around this time. Not a very summery look for Mid-August is it?! This summer is cooked. The Bermuda high has never been able to establish itself. It has been one trough after the other helping to keep the heat down for the eastern half of the nation. I am not complaining at all. I am not one to beg for heat waves but I do love summer heat and the feeling of summer quickly passing us by can not be denied. That is why it is imperative to make this weekend a keeper! On a final note, the Climate Prediction Center also reported reported this week that the chances of an El Nino weather event have been reduced by its estimations from 80 to 65 percent. Many forecasters predicted El Nino to emerge during August-October. An have an impact on a below average Hurricane season. It appears El Nino will peak at weak strength during the late fall and early winter,” the agency reported. The agency also doesn’t see the likelihood of a strong El Nino, rather calling for a moderate or weak weather event in the Northern Hemisphere.